To celebrate the arrival of HighStreet 5’s eagerly-awaited X’Mas Version, we will be giving away FREE Gift Packs to the early birds who update and play early! From the server reopening on 15th December to 23:59 on 17th December, 2009, you will receive ONE FREE gift pack if you login and stay in-game for more than 60 minutes! Could there be any better deal? 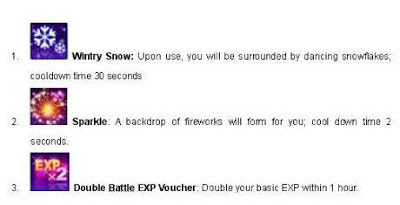 The gift pack includes Wintry Snow*10, Sparkle*10, and Double Battle EXP Voucher*5. 1. Please log into the PRIZE Collection Page to collect the gift pack in 5 working days after this event ends. 2. You must collect the Free Items before 28th December, 2009. The items for this event that remain unclaimed after this date will be forfeited.